Last week, one of my strawberries started to ripen. Just one. I'm so tempted to pick it, but I know it will be worth the wait. This one strawberry has become my baby. I'm doing everything I can to keep it safe and out of harm's way, so that my first taste of a garden fresh strawberry is a good one. As my strawberries are ripening, I'm concerned about birds, slugs, and rotting fruit. Slugs: If you missed last Thursday's post on slugs, click here: or scroll down to the next post. 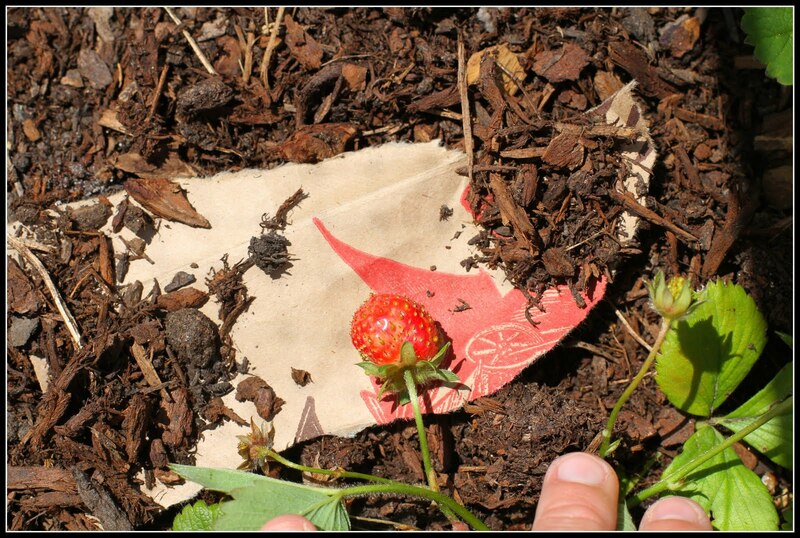 Mulch is the best resource for keeping your strawberries from rotting or growing mold. Straw is the best mulch for strawberries. That's easy to remember: Straw for strawberries. I used a top mulch that I purchased from a nursery, but will add some straw now that the fruit is ripening. Simply lift the vine the strawberry is on over another part of the plant to keep the fruit off the ground. 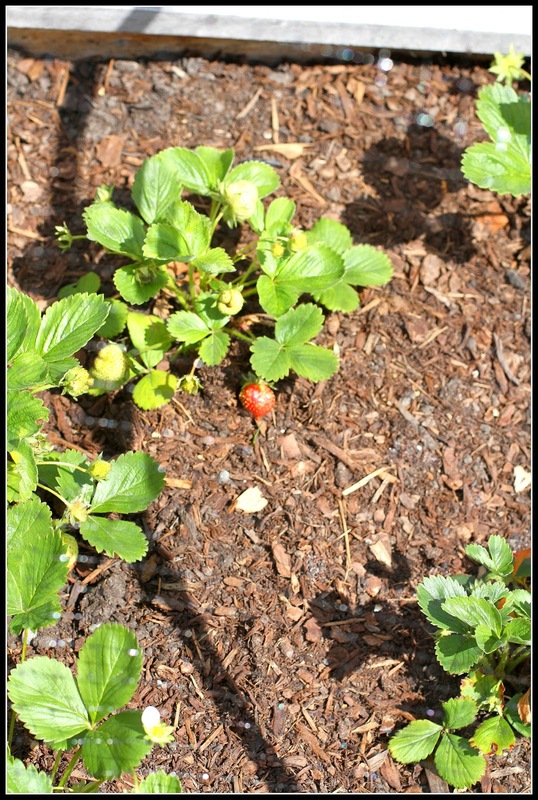 I have added mulch, I lifted the strawberries off of the ground, but am still not taking any chances with my one (almost) ready strawberry. I placed a piece of a paper bag under the fruit. I'm obsessed. Snap off the stem so there is about a 1/2 inch of stem attached to the strawberry. Harvest once the entire fruit is red (no white left). Keep the strawberries out of the sun and place in the refrigerator as soon as possible. Once some of the strawberries start to ripen, you will be harvesting every other day (sometimes daily). Make sure to keep up on your harvest. Also, weeds can cause serious problems for strawberries, more so than other vegetables and fruit. This is because they have very shallow roots which causes them to compete with weeds for water, oxygen, and nutrients. 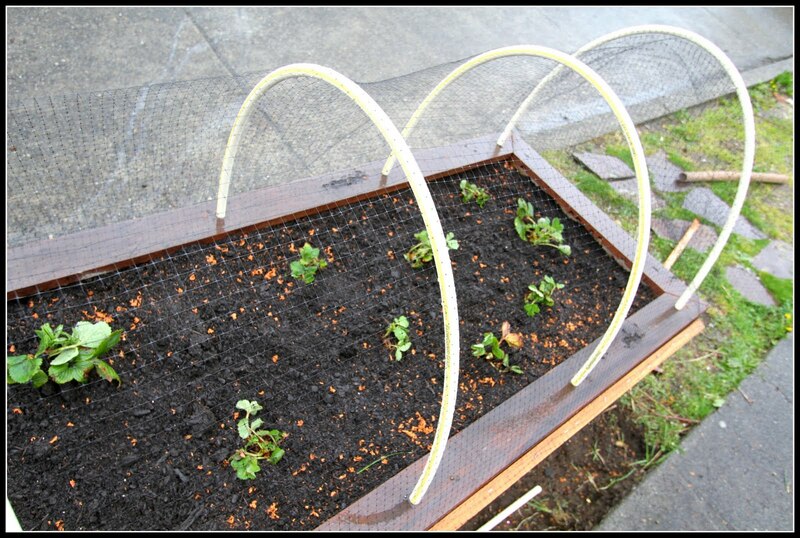 If you are going to weed any part of your garden, choose your strawberry bed. Can't wait to make strawberry shortcake with my one strawberry!